If you haven’t quite figured it out yet, we live in what some call “The Experience Economy.” Read the book with the same name, written by Joseph Pine II and James H. Gilmore and see if you agree. Then, just take a look around. Escape rooms – a business where people pay to get locked in a room for an hour and must solve puzzles to get out – is growing steadily. Popular shows like “House Hunters” and “Fixer Upper” on HGTV, and “Diners, Drive-ins and Dives,” and “Holiday Baking Championship” on Food Network, focus on people and their experiences as they complete tasks like renovating their home or cooking. The good news for those of us working in the outdoors industry, specifically in hunting and angling recruitment, is that doing anything outdoors, even if it’s an activity you’ve done a hundred times before, is always a new experience because nature ensures no two experiences are ever alike. It’s not the endpoint we have to think about, it’s the experience on the journey to get there that needs more attention; equipment purchase, gaining skills, etc. For instance, canoeing isn’t about being able to put your canoe in and out of the water. It’s about the calmness or wildness of the water, seeing wildlife, breathing the clean air and the soothing sound of water. Hunting should not be measured by the size of the trophy, but the ability of individuals to handle changing weather and the new animal behaviors learned each time. To learn more about customer experience and thriving in the “experience economy,” I participated in my second Experience Week, which is dubbed “the world’s largest customer experience event.” Qualtrics, a software company that helps businesses measure aspects of customer experience, hosts this online event. As I watched the videos, it struck me how much a focus on customer experience in hunting, fishing and shooting sports could change the approach to growing participation in these activities. Based on my attending Experience Week, here are five ways to turn customer experience for business into concepts that will recruit, retain and re-engagement – often called “R3” – shooters, hunters, and anglers. In his online talk called, “What Turkeys and Competitive Eating Teach Us about Problem Solving with Data,” Stephen J. Dubner describes how Takeru Kobayashi, a competitive eater from Japan, changed the approach to hot dog eating and not only won his first contest, but also broke the hot dog eating record at that time by nearly double. Rather than asking how to eat more hot dogs (in the same way), Kobayashi considered ways hot dogs could be eaten more efficiently. Most agencies and outdoors organizations are asking how they can increase license sales. What if, instead, they asked how to help more people appreciate the outdoors and a direct connection to food sources? Reframing problems stops us from trying to move the numbers in the same old ways and makes us focus on the aspects of hunting, fishing, and shooting that directly connect to human needs. Taking a look at a problem from a fresh perspective results in new solutions while forcing us to consider how new people get involved in the outdoors and what prevents many people from doing so. During the online “Experience Week” event, David Schonthal, director of business design practice at innovation company IDEO, gave an interview called Finding Insights in the Most Unlikely Places. Schonthal’s design research section at IDEO includes sociologists, anthropologists, and psychologists to gain a deep understanding of people. They work to identify the human needs that are being met with each product or service of the companies they’re consulting. Hunting and fishing meet the human need for food, relaxation, belonging, and a challenge. With the exception of food, shooting sports meet the same needs. For firearms shooting, the other needs include safety or personal protection. When you understand the human need, your approach to marketing can change dramatically. And when customers believe you understand their needs, you’re more likely to increase the attraction for more of them. Hunting and fishing involve all five senses and conjure emotions such as serenity, anticipation, confidence, determination, and excitement. These activities are good for both mental and physical health. Shooting evokes many similar emotions and is a way to connect mind and body. Fear is often a factor in firearms shooting, but that just means there’s room to build confidence. Connect the emotions and you connect more people. “Those [the average customer] are great people to speak to when you’re trying to validate a solution that you might already be familiar with,” said Schonthal. “But if you’re trying to come up with new solutions, there’s usually not a ton of interesting stuff to be learned by speaking to the people who are using your products and services exactly like you expect.” To get more, and perhaps better insight, you need to look at the two extremes: novices and fanatics. For me, getting new people into hunting and fishing means studying the newest participants. Talk to those that didn’t grow up with easy access to these activities and you will likely hear a long list of problems they face that you’ve never considered. I recall studying a program conducted in a St. Paul, Minnesota middle school that aimed to provide youth with no family hunting history and appreciation of outdoors and hunting. The instructor, raised in hunting found that upon reaching the woods for the first time, a majority of students returned to camp because it was their first exposure to darkness, stillness and being alone. Lifelong outdoorsmen don’t realize that getting started in an outdoor sport isn’t as easy as deciding to go and then going; there are many points along the way that intimidate first-time participants. 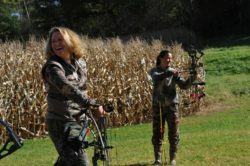 Groups of women, teenage girls, African-American moms, and newly acquired women shooters from the most heavily gun-legislated states could provide plenty of insight into the best ways to introduce new people to outdoor pursuits. On the same token, the most avid users – those buying every hunting and fishing license, gathering recipes, and constantly researching techniques – could offer ideas about engaging with your most loyal customers. Listening to and learning from the people on the ends of your customer spectrum is likely to lead to better service for even those in the middle. Dubner uses the hot dog eating contest example to illustrate that some imposed barriers might not even be real. The record for the number of hot dogs eaten inadvertently prevented people from thinking about the approach to eating them. Those are the kind of barriers that stifle real innovation. I believe there are some underlying barriers to getting more people involved in hunting, fishing and shooting. Using words like “tradition” shut out many people because they associate traditional hunting with killing animals as trophies, and never learn that there’s much more to hunting. Instead, those of us trying to engage more people in the outdoors could talk about the joy of being in the woods when the sun rises and the excitement of hitting a bull’s-eye after weeks of archery practice. Non-hunting canoers, hikers, and wildlife watchers aren’t enemies; the “rip-stop nylon” crowd might be your biggest allies. We can acknowledge the accomplishments of hunting, fishing and shooting’s past but then focus on the future. Where is outdoor recreation heading? What do the participants of today expect from their activities? Which activities are increasing and what can we learn from them? The Alabama Department of Conservation and Natural Resources just built the state’s 13th archery park based on the philosophy that archery belongs at the recreational hub of a community alongside every other form of recreation. The state agency partnered with parks and recreation agencies that care for local public land and resources. They partnered with schools and recreation centers to provide archery programs and ignored the barriers that typically relegate archery to secluded areas far from other people and amenities like restrooms and drink machines. What other barriers can we overlook to make outdoor pursuits more accessible to everyone? What if a doe permit were thought of more as an extra food permit? Would wildlife agencies approach them differently? What if hunters and fishermen were encouraged to share pictures of their best meal instead of their trophy photos? Would non-hunters gain a better appreciation for hunting? What if stories and emotions regarding the “one that got away” were more abundantly shared by hunters and fishermen? Would more people understand the rush of hunting doesn’t always come with meat but results in the same number of stories? What if non-fishing lake users were directly approached by fish and wildlife agencies to help fund all water resource protection? Would the people that windsurf or paddleboard see all water recreationists as equal resource users? I’ve seen people thinking differently about the outdoors and am talking to people that are ready for change. Some archery retailers have started treating their ranges as recreation centers instead of social centers for “regulars” and it’s making their businesses relevant to today’s customers. The Iowa Department of Natural Resources’ Let’s Go Hunting campaign is starting to dig into the emotions of hunters, and outdoor writer and television host Steven Rinella has made hunting about the challenge and the food. More groups like Well-Armed Women, Shoot like a Girl, National African-American Gun Association, and Wisconsin Women Fish are working to reach under-served audiences. Manufacturers are creating more products for women – although there still aren’t enough products built by women. I’m optimistic that progress toward new thinking about hunting and fishing recruitment will continue, even if it’s slow. There is an opportunity out there for those willing to take a look at things a little differently. I play my part by studying, writing and consulting with customer experiences in mind. I venture into new places and constantly review my own assumptions. When possible, I take new people shooting and I listen to my kids, nieces, nephews and their friends because they are the hope for the future. Trying new activities, for me, is an adventure and a way to understand the intimidating factors beginners face. Contact me if you are looking at the future and not quite sure how to achieve your goals. I can help you reframe the problem, identify your customers’ needs and the emotions that drive them and start generating new solutions.